Since Warhorse's Kickstarter pledged a realistic, Middle Ages RPG with period combat in January 2014, the team have been slaving to build the framework that will support all that praying and dying in childbirth. According to the latest update video, this will be finished by the end of the year. 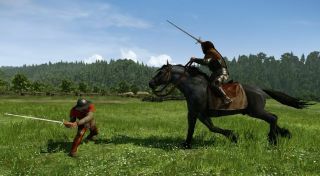 Beginning early in 2016, Kingdom Come: Deliverance will move into beta. The 'technical alpha' has been available to certain tiers of Kickstarter backer and anyone willing to spend $50 since October 2014, but beta is a much larger proposition, consisting of several quests from the main story, the first major battle of the game and about a fifth of the final world map. If you've been following the alpha for the past year, lead designer Viktor Bocan also pops on to enlighten us further about the implementation of the current alpha build's crime system, emphasising the freedom to rob, stab and wreak havoc as you jolly well choose (although excessive murder will break the game right now). Add to that some discussion of how the soundtrack will adapt to your actions, and it really is no surprise that Warhorse had to push the release date back to summer.